While the EU RoHS and the initial China RoHS compliance deadlines have passed, manufacturers are still struggling to define sustainable environmental management systems (EMS) and processes that they want to put in place as regulatory environment keeps changing. Collecting data from suppliers:The ‘Achilles Heel’ of product compliance is the ability to collect accurate material declaration data from suppliers efficiently. The problem is compounded when data such as lab reports need to be refreshed periodically. 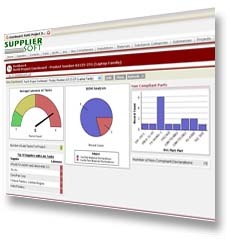 While some companies have implemented compliance solutions that analyze Bill of Materials (BOM) for product compliance, inability to collect data from suppliers severely limits the usefulness of these systems. Analyzing product level compliance: Companies without automated product compliance solutions are forced to analyze the entire BOM manually for compliance to myriad of regulations and customer specific requirements. This is time-consuming and error-prone, creating potential delays in time-to-market and in worst case, risk of non-compliance. Reporting to customers: When customers need a certificate of compliance or want a material declaration with lab reports, providing the data can be challenge without a centralized system. Inaccurate and dispersed contact information: Frequently, identifying an EHS contact at supplier location takes weeks, if not months. Contact information is stored on desktop in Outlook/Notes. As people change roles at supplier and within a company, the contact information becomes obsolete. Managing compliance projects: When new substances are banned by regulations or customers, companies need to work with hundreds of their supplier at once, things get harder. Mass communications inevitably lead to “bounced e-mails”. It is hard to track which suppliers have received the e-mail, how many of them have responded and what the response was. Gaining central visibility into compliance: Companies with manual processes find that enforcing cross functional processes is difficult. Most of the information ends up in e-mails and Microsoft word, excel and pdf, leading to lack of central visibility into compliance information.